What is the connection between diabetes and fatigue? Can diabetes cause fatigue? You can be fatigued for many reasons including worrying, but when you’re a diabetic, it’s more of a cause of being tired all the time. Since having diabetes means you don’t have enough insulin and your blood sugar levels are too high, and in turn causing your fatigue. So if you’re not getting enough sleep, this will tire you throughout your day affecting your blood sugar level control and can impact you for other health factor risks. It seems to be a merry-go-round. Not really merry now, is it? I have to say that, I know I speak for millions of people who have insomnia or can’t sleep for a variety of reasons, that not getting the adequate amount of shuteye just takes it’s toll on you and you feel like a walking zombie the next day and you can’t see straight. Whatever the reason or reasons for not sleeping, we just want a solution. It makes us almost to the point where we can’t function and even complete the simplest tasks. Eating a well balanced diet is a tremendous help! You want to experience weight loss for diabetes too. Dehydration. Being a diabetic, you’re more apt to be dehydration. If your blood sugar levels are high, chances are high too that you’re dehydrated too. Depression. It’s imperative to know the connection between depression and fatigue, because fatigue can be a common symptom of depression. With diabetes, it’s even two times as common to be fatigued. Stress. I’ve mentioned stress in another article and it goes without saying that stress cause fatigue. Not to mention that it wreaks havoc with your sugar levels as well. Caffeine. I think most folks know that too much caffeine keeps you from falling asleep and in addition is connected to high blood sugar levels and linked to insulin resistance as well. Stick with apple cider vinegar instead of caffeine. Frequent urination. I can relate to this because when your sugars are high, your kidneys are trying to remove the excess sugar. It’s the middle of the night bathroom trips that can make you fatigued if you’re getting up more than once and not falling back to sleep. One tip is to try and not drink too much before bedtime. Exercise. Not getting enough or any exercise at all is NOT a good thing. Go walking, ride a bike. You want to improve your insulin sensitivity, cholesterol levels and exercise of any kind will help you achieve this. Get an exercise bike. It may be wise to look into supplements for help too. It will aid in your fatigue problem, just don’t do any heavy exercising. The feeling you get from being tired from diabetes is most likely due to high blood sugar. Insulin isn’t removing the glucose from your bloodstream and your cells require sugar for energy, but your sugar levels are probably out of whack thus causing your tiredness. If your cells aren’t getting the sugar it needs for fuel because it isn’t entering your cells normally, then guess what? Your cells aren’t getting the fuel they need to burn producing and energy and there you go! Tired, fatigue sets in! As far as I’m concerned, next to Vitamin D, this vitamin is the next most important if not equally important for you. Whether you’re fatigued from diabetes or another ailment, you really should have your vitamin B12 levels checked. Nerve damage or peripheral neuropathy is another side effect of diabetes. High blood glucose over a period of time is the cause of this. For me, it’s numbness in my feet, but it could also affect your hands and other parts of the body with weakness as well. And you don’t have to be a diabetic to develop neuropathy. Anemia. To get straight to the point: it means you don’t have enough healthy red blood cells. Your cells need oxygen and you develop anemia, your cells become deficient in oxygen. Anemia can lead to dementia, irregular or fast heartbeat, shortness of breath and even lose your sense of smell and sense of taste. You can also experience numbness, itching, tingling, feelings on your skin and in your extremities. You do NOT want anemia. Like Vitamin D, it aids in protecting against lung, colon, breast, and prostate cancers. Fatigue in itself is one thing. Fatigue related to diabetes shows symptoms of frequent urination, weight gain or loss, and excessive thirst. Let’s talk about diabetes and energy. Lack of energy: being immobile, laying around and not doing anything. The less movement, the less your cells use blood sugar. Remedy: Any exercise that requires movement such as household chores. Just get moving! Lack of energy: stress; Being stressed and who isn’t? Too much stress affects your sugar levels and that robs you of energy. Remedy: Slow down. Think first before you let stress get the better of you. Take a moment to think before you react to stress and then talk it out, but don’t rush your speech. One word at a time. Lack of energy: medication; Some medications that you take for diabetes or other ailments can cause fatigue too. Remedy: Speak with your physician if you feel that your medications may make you tired. He or she may choose to adjust your meds. They also want to be careful and make sure that hypothyroidism or anemia are not the culprit keeping you dragging all the time. There are supplements that are beneficial for lowering your blood sugar too. Lack of energy: Blood sugar numbers; Too high or too low blood sugar numbers are the cause. Remedy: Check your glucose levels regularly with a reliable test meter and see your doctor often. Perform breathing and relaxation exercises. Spend time with loved ones, pets, or anything that calms you. Avoid the stress people! Do something relaxing. Watching fish in an aquarium is soothing and relaxing. This also helps in lowering your blood pressure. Take up yoga. It is wonderful for your mind and body. Walk. Take your favorite music and listen on your headphones. This is my favorite. See your doctor. Make sure you don’t have anything else that would cause fatigue. Make a plan. Keep a log and check your sugars often. What are your energy levels at different times of the day and night? Write them down. Eat healthy foods that give you energy. You should plan for a good night’s sleep because otherwise you’ll be tired and dragging the next day. Set up a routine and follow it. Go to bed at the same time each night and don’t eat too close to bedtime or do any heavy exercise before you turn in. Your bedroom should be a temperature that is comfortable for you. Keep the room dark from any light obstructions and keep electronics such as computers and TV’s off. For me though, the TV relaxes me a bit, but that’s just me. You may be different. Do what works for you. If you can sleep well, then you won’t feel fatigued the next day, but you’ll still have to be working on the diabetes issue, if indeed that is the cause of your fatigue. So is there a connection between diabetes and fatigue? Controlling your diabetes and sugar levels helps you with fatigue and other diabetic issues. But if you feel you need a boost and want something to really help get those glucose numbers down, this is what works best! I really hoped you enjoyed this article because it is important and I really wanted to share it with you. If you have any questions about fatigue and diabetes, please leave a comment below. I would really appreciate it. Thank you! Lots of great suggestions for diabetics on how to manage tiredness Rob. As diabetes is a disease that is growing to epidemic proportions there will be a growing audience for your blog advice on this subject. I enjoyed reading the article. You might like to discuss diet also if you haven’t arleady, as my understanding of diabetes is that in many instances it is the result of obesity. There are so many things related to diabetes and some folks don’t even realize that their fatigue can be as a result of diabetes. It is a world wide epidemic and people should know everything about this horrible disease and don’t assume that it is routine fatigue. I was unaware that there was any link between fatigue and diabetes. I had no idea that lack of sleep and insomnia could be a cause of or related to high blood sugar, insulin resistance or diabetes. It was really interesting to see the relationships explained. I see that stress is also a cause of fatigue. I have had problems sleeping and given the other factors here I think it may be stress. What do you recommend for stress relief? Diabetes can be caused by many things. Fatigue could just be one factor. Stress definitely is another big cause of diabetes. Feeling tired and not sleeping from insomnia are huge issues and they take its toll on our bodies. For stress, I recommend exercise, yoga, or being outdoors with nature. Another great stress reliever for me is relaxing music. When I’m not stressed, I’m not really fatigued either. Really glad to bump in this post today because I have relatives that has diabetes and I am really afraid that I will be diagnosed with it one day. Thus, after reading this, I now know how fatigue could be linked to diabetes and I really found this post useful. Thanks! You don’t have to be afraid of it if you take the right precautions. Just because you may be fatigued doesn’t mean you’ll get diabetes. Watch what you eat, exercise and see your doctor regularly. If you’re fatigued all the time, have it checked out. When I became a vegetarian I looked into the symptoms of vitamin B12 deficiency and it isn’t pretty. I take a high quality supplement and have my levels checked regularly just to be safe. I worry that my boyfriend is becoming diabetic because he eats so much sugar. He occasionally deals with fatigue but says its much better when he cuts back on sugar. I didn’t realize caffeine was connected with high blood sugar levels…another reason to cut back! Katie, sometimes we don’t realize what is causing the issue we’re having until afterward. B12 could definitely cause fatigue but it’s not wise to assume that it’s just that without checking into having labs done just to make sure you find the cause. For me, I stay away from caffeine too. Hi Rob,thanks for sharing about the diabetes and the importance of vitamin B. Depending type of diabetes, what I understand is that certain type of diabetes can be cured through diet and exercise, while some of it can’t be cured. Health supplement and vitamin did play an important part in helping the diabetes patient from taking a long term medication to control their sugar level. 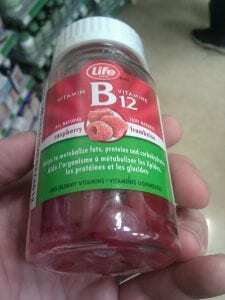 All vitamins are important but I feel that B12 and D are extremely crucial for your health. While diabetes can’t be cured it can be controlled and with diet and exercise that makes it possible to lead a normal life and not be fatigued all the time. It’s better to lower blood sugar with natural ways than with medication.